This morning at 11:14 AM EDT United Launch Alliance (ULA) successfully launched another Orbital ATK Cygnus spacecraft towards the International Space Station (ISS). This was the third Cygnus that ULA has launched for Orbital and at the present time the last. 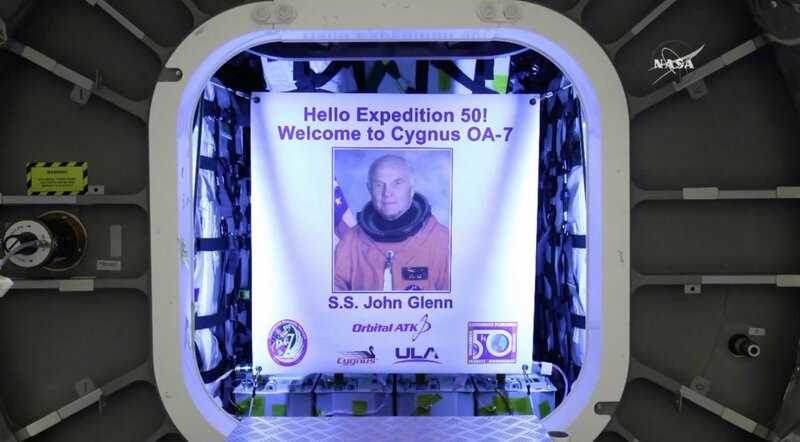 Named after the late John Glenn, former Astronaut and US Senator who passed away last December. The launch was delayed several times to allow ULA time to address some issues with the launch vehicle and pad, and then to accommodate the hectic ISS schedule. 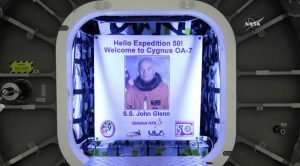 The vehicle is carrying 3,459 kg (7,626 lb) of cargo to the space station and will spend at least 80 days at the station before being released. After it is successfully completed its mission another of the Saffire experiments will be performed, where a controlled fire will lite. Once that is complete the vehicle will burn up in the atmosphere. The countdown proceeded smoothly this morning with an on-time launch, which concluded when the Cygnus spacecraft was delivered to orbit. This was ULA’s 71st Atlas V, 36th 401 config, 4th launch of 2017 and 119th consecutive successful launch keeping their perfect 100% record. As a side note, this was the last launch for NASA PAO George Diller who has been the voice of NASA for many launches in the past. We hope that he has a great and long retirement and will miss hearing his commentary.